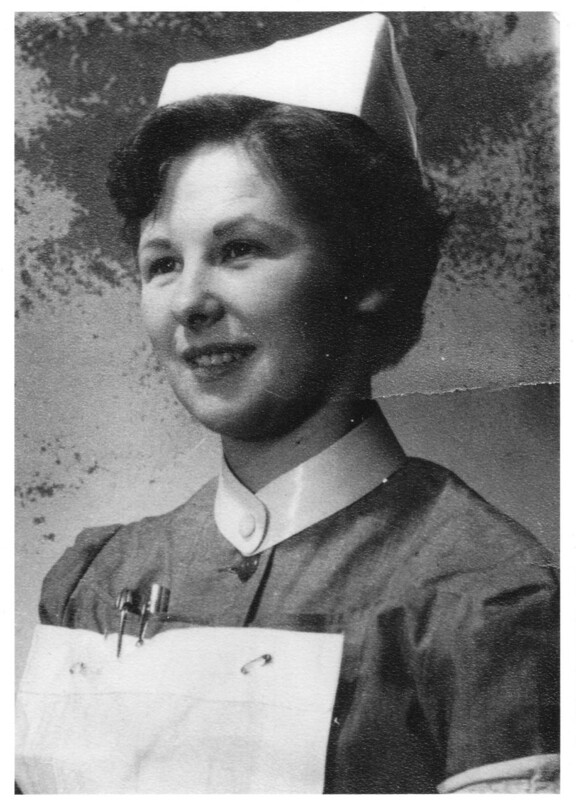 Some of you may be aware that my Mum is a retired midwife from the old school of nursing much as portrayed in many “Carry On” films. My earliest memories of her is going off for work in a blue dress uniform with frilly arm cuffs, larger than life navy blue superhero cape with the red bands crisscrossed across her chest to keep it in place and the handkerchief part of her white cap floating behind her. Over the years she has been called upon by friends and family alike to change dressings, recommend medications for a variety of symptoms and tend to an array of ailments. She is still able to detect a pregnancy in its early stages often long before the expectant mother not to mention the many times when some stranger has whipped out a rash for more formal identification upon discovering her occupation. Earlier in the year a young single mum rented out one of the houses in our street along with her five-year old son. As the months passed it became apparent that she was pregnant and in the last couple of weeks Hobo, our black rescue cat, had taken to sleeping outside her front door. Not an uncommon occurrence for the big fella, as with many animals he has this uncanny ability to be the first to notify us of an impending arrival. So it was no surprise that a loud knocking on the door notified us that our neighbour had gone into premature labour and owing to the recent storms and flooding, the ambulance was unable to get through to the village. With the organisational ability that a Regimental Sergeant Major would have been proud of, my mother surveyed the scene and realised that the increasing regularity of the girl’s labour pains meant we would be unable to get her upstairs before the baby was delivered. This was going to be no mean feat as my mother herself had just had recent knee surgery but irrespective of the environment, one thing was sure; this baby was on his way. “Fetch your father” the Sergeant Major barked at me. My father was no fan of the practicalities of childbirth preferring instead to travel behind the ambulance in his car whilst my mother had been transported to the hospital in the advanced stages of labour when my sister and I were born. He blanched when I gave him the news but was rather relieved when he realised he was just being called upon to assist me in changing the light bulbs to provide a well-lit lounge whilst my mother made our neighbour as comfortable as she could on the lounge floor. By this time Hobo had strolled in, as any open door is an invitation as far as he’s concerned, looking at us all as if to say “don’t say I didn’t warn you”. As Dad and I kept the little boy distracted in the kitchen leaving the Matron to tend to his mother his little brother screamed his way into the world. As it was Xmas Eve the timely arrival of this little baby had not gone unnoticed and we realised how lucky we were to be part of our own nativity story. Whilst there were no wise men bearing gifts, the news of the delivery had spread fast and the couple that owned the local village shop arrived with supplies for the baby. An elderly lady who made blankets for the Syrian refugees brought one for our new arrival and even Sid & Ernie (the dynamic duo) had borrowed a tractor to drive through the floods to transport the local practise doctor who had arrived somewhat late to the party but announced that my Mum had done a sterling job. Whilst this wasn’t the holy birth, it was a tiny miracle nevertheless as are all births and one which had brought many of us together on a stormy Christmas Eve in a little Devon village. So I want to take this opportunity thank all the Emergency Services who are never truly off duty regardless of the time of year and to whom many of us owe a huge debt of thanks. Call the midwife is WONDERFUL, perhaps the best television I have watched. What an admirable woman, your Mum! Glad tidings for Christmas indeed. And terrific writing, as always! Well done all of you, especially Hobo! My mother was a midwife in London at roughly the same time as Jennifer Worth and loved the book and series. Bet your Mum has some fine stories to tell too. Helping in the birth of another human being is probably the closest we can get to the mystery of life. For most of us can’t remember that awesome entrance into this world that we have all experienced. Best regards to your mother. I’ve never seen the TV show, but the profession is one that I especially admire. Dear Both, I have loved your pictures as well as whilst I haven’t travelled very far this year I always feel that I do when I shuffle through all yours so thank you for sharing them with us. PS I subscribe to the Bette Davis school of nursing so I don’t think that’s a skill I inherited from my Mum at all! The “superhero cape” is well deserved! Thank you for sharing this wonderful story. I wish you and your newest neighbor all a very Happy New Year! Fortunately she doesn’t wear her pants over her tights (pantyhose) as we would probably be thrown out of the supermarket. But I have to admit that the old girl did good and is a terrific nurse. Happy New Year to you & yours too! What a heartwarming Christmas story – so lovely. Hope Mum and baby are both doing well. How wonderful, and well done to your Mum. What great neighbours you are. Happy New Year; I’m looking forward to all your new stories in 2014. Happy New Year, village life is always entertaining – how’s life in your new country/apartment? Two of my sisters had two of their three (each) children at home delivered by mid-wifes, wonderful women! Your mother certainly earned her superhero cape. What a fabulous story and you got to be there (even if only to change the bulbs and make tea). thank you for sharing this lovely story, you always have the best ones. What a wonderful way to spend Christmas eve! Kudos to your family – especially your mom! What a super woman – she probably needs a cape now! What a lovely story CT! I recall living in the English countryside how much people depending on neighbors and local emergency volunteers – since, even in good weather, it was a long time before anyone arrived from the closest hospital. Your neighbor is very fortunate to have someone as caring and talented as your Mum nearby! Remind me to have your mother on speed dial should I ever decide to get pregnant haha! How fortunate your neighbor knew to come to your house first and that the whole neighborhood pitched in to welcome the new baby. What a lovely Christmas story. My aunt who was due on Christmas went into labor at our house on Christmas Eve in the middle of dinner. However it was the early stages and she made it to the hospital with plenty of time to spare and didn’t give birth until the afternoon of Christmas Day. So we all trooped off to the hospital to see our new cousin/niece. A very special Christmas indeed, though 13 years later I think my cousin is realizing having your birthday on Christmas isn’t all it’s cracked up to be. Thanks for the tip about the TV series … never heard of – have to find downloads. You really know how to tell a story – a wonderful story, so heart griping – and I can see that tractor driving away through the flooding. And what a wonderful job your mum had. Thanks for this sunshine and feel good story. You should publish all your stories … and call the book “Stories from a little Devon Village” … I would buy it. A lovely story. Congratulations to all!!! I love this story. It’s amazing that any of us are when you think about all that can go wrong during childbirth. Cheers to your mom! And thanks for the show recommendation. I’ll check it out. My mom was a RN, and head of women’s surgical, and did a lot of baby birthing. I LOVE your story, nothing like having a mom who’s a nurse! She was going to deliver my Angel Boy at home, but it became apparent that he was going to be too big for me, and I had to have an emergency C-section, which always made me kind of sad, but then the outcome was worth it.